The Highway is changing things up with an all-new heartier menu that is perfect for these cold winter months. Traditional dishes made modern is the inspiration behind the new menu, which has only been available for three weeks so far. The Highway hired new and talented Head and Sous Chefs, where the two have paired up to create a selection of dishes that any customer will enjoy. “We like to try something new and keeping the menu fresh using both of our talents combined and see what works well with using all fresh, South Australian produce,” he said. The two chefs love the creative reign they get over the menu and love trying different things to create delicious but simple produce driven dishes. “We are trying to change the vibe, trying to put on a new flare and bring a different creation to the place by changing the menu around,” Mr Coad said. “With Ashley on board now we are pushing towards simple stuff, very produce driven. A little bit of old school but done in a new school way,” Head Chef, Damien Fong Lim said. All the dishes are beautifully presented and created. It is clear that a lot of creativity and thought went into each dish and that each ingredient is sourced fresh and locally. The Roasted Chicken Roulade with apricot stuffing, carrot and jus. This modern meal was a beautiful take on a traditional chicken apricot dish. The chicken was wonderfully tender and juicy and was a lovely pair to the tangy sweetness of the smooth apricot filling. 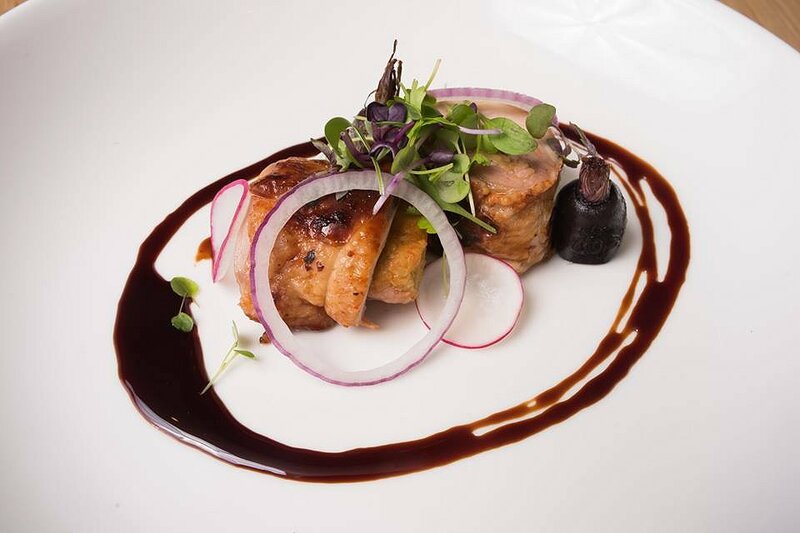 The tang of the balsamic jus tied the whole dish together and added a sour tone that balances the savoury chicken and sweet apricot filling. 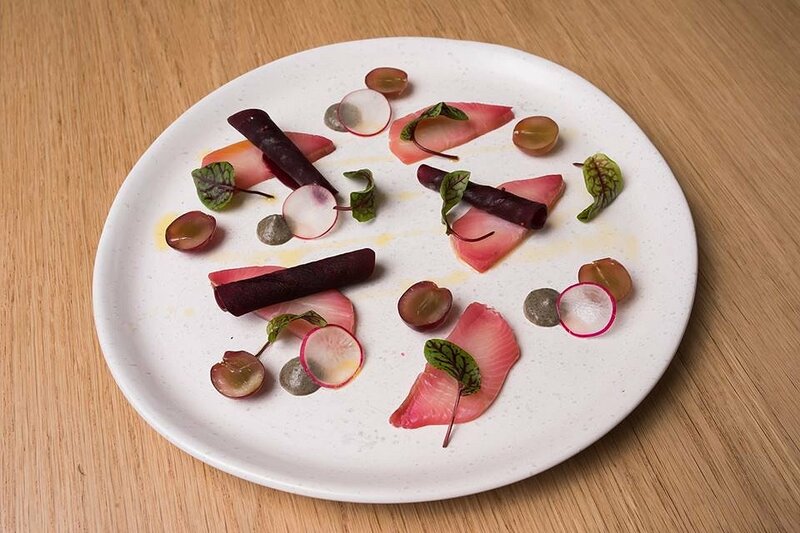 The Kingfish was served with grapes, beetroots and a burnt onion purée. Not only a very pretty dish but it was also very tasty. The Kingfish was beautiful and fresh and gave off a lovely, slightly salty, sea flavour; while the sweet grapes provided acidity and sweetness to the savoury meat. The smooth burnt onion pure with crunchy pickled beet and radish slices gave of a lovely balance of textures and flavours, with the pickles and the burnt onion flavours not too overpowering, just a nice hint of the savoury and sour tones that paired well. The Confit Pork Croquettes was served with crispy kale, pickled shimeji and aioli. The croquettes had a lovely soft and gooey centre with crispy fried outer coating. The cool, smooth aioli added a lovely sweet tang, wile the crisp and light fried kale was lovely balance, lifting the heavier flavours of the fried croquettes. 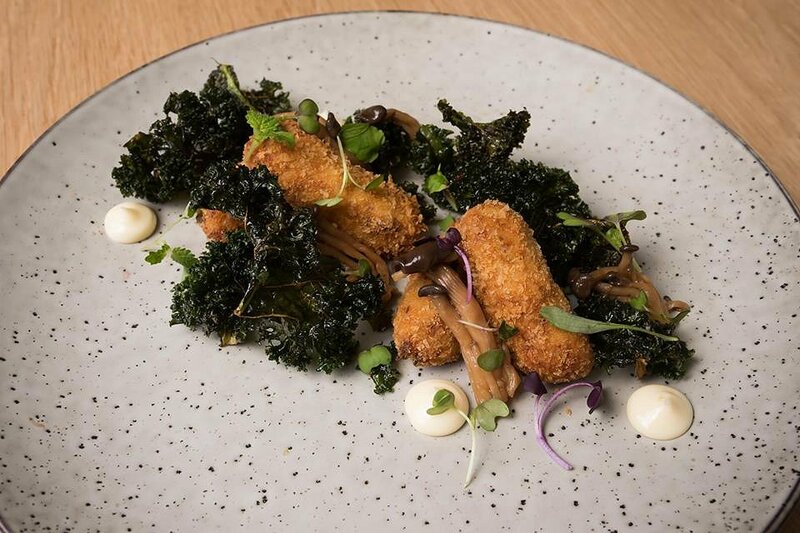 The pickled shimeji mushrooms were a lovely additive, balancing its strong acidic flavours with the kale and croquettes themselves. The overall dish had a lovely combination of flavours and textures. 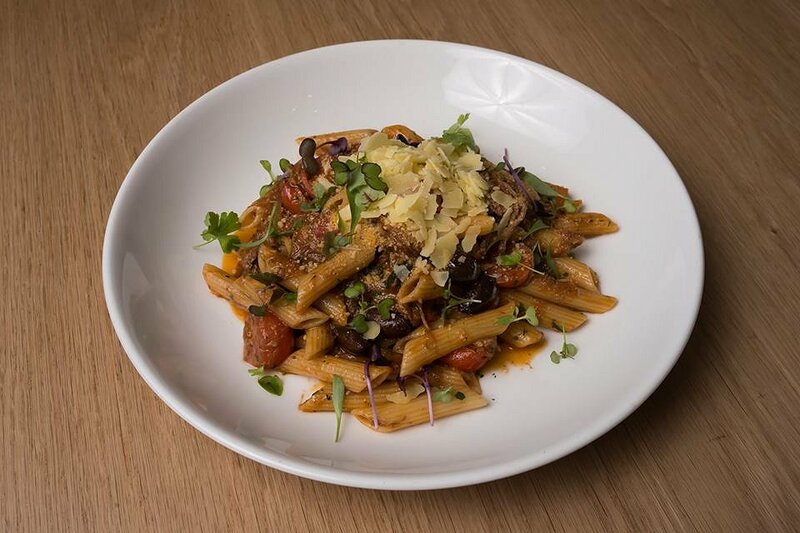 The Penne Lamb Ragu was made with slow cooked lamb, tomato, olives and basil. The fresh pasta and meaty tomato sauce had a wonderful balance of flavours and was one of the favourite dishes of the day. The beautiful and tender lamb was full of many earthy spices. The pasta itself was infused with the flavour of the olives, which left a nice tang in your mouth with every bite. This flavour combination tied in beautifully and the prominent flavour of the olives were not overpowering the other ingredients. The kick of the sharp Parmesan tied the rest of the dish together; while the pop of the cherry tomatoes added sweeter tones to the complete dish; overall a rustic looking but delicious meal. 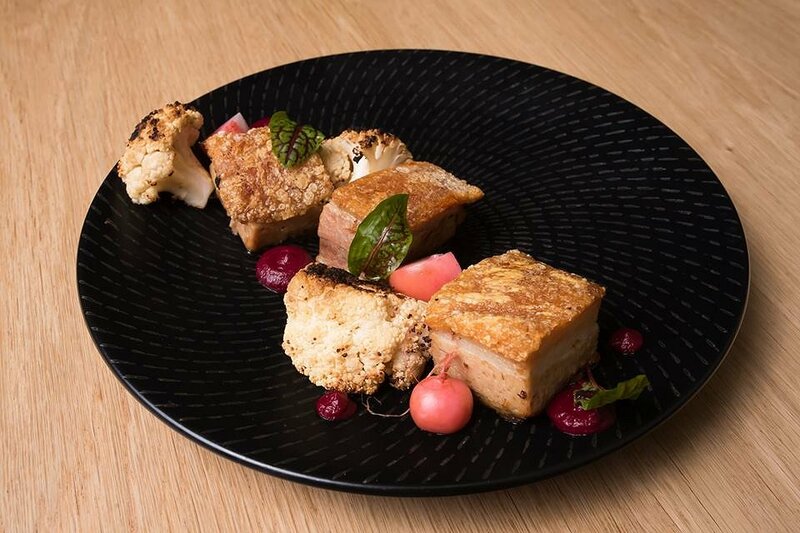 The Slow Cooked Pork Belly was served with pickled radish, charred cauliflower and beetroot purée. The soft, tender pork with its crunchy, salty crackling skin was delicious. The additive of the pickled radish added a sweet tang while the sweet smooth beetroot pure was a beautiful pairing with the juicy pork meat. I could just eat it all day. The chargrilled cauliflower was crunchy and still fresh, with smoky tones from the grill, infused into the dish. Overall a lovely balance of sweet and savoury with smoky tones. The Braised Beef Cheek was plated with crispy kale, new potatoes and a sweet corn purée. 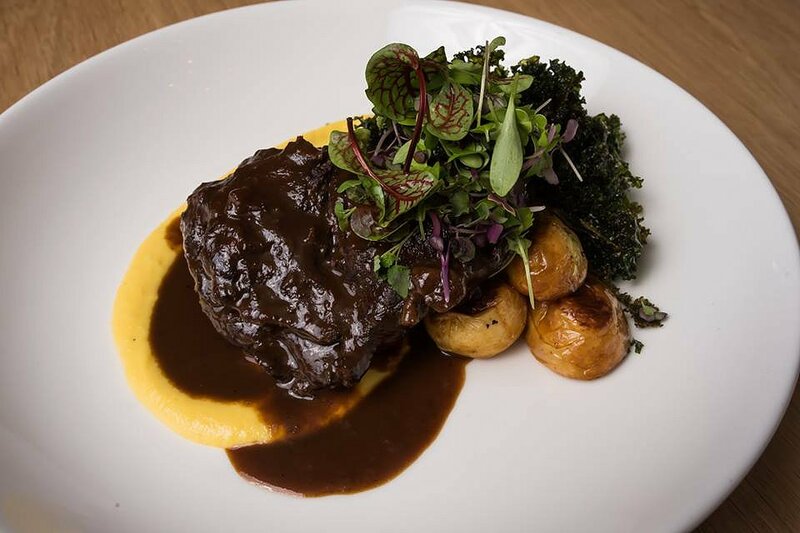 The beef cheek was huge in proportion and is great for those customers who are very hungry. The cinnamon and rosemary flavours in the beef’s marinade was a prominent flavour, but was not too overpowering; complimenting the earthy flavours of the succulent beef. The gravy and corn pure was a delicious combination and I could not stop eating the sauce. The dish had a lovely balance of spices and textures, with the soft meat and creamy gravy and corn purée, and the crunchy outer and soft centred salted potatoes. 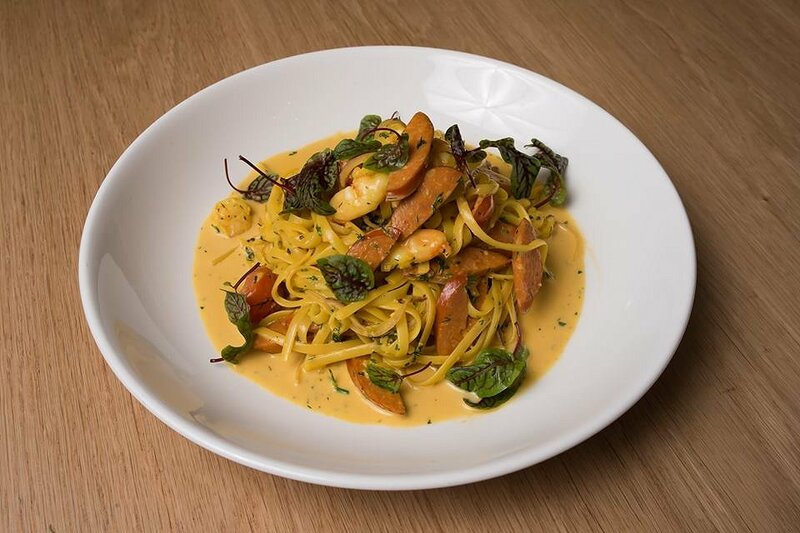 The Spencer Gulf Prawn Linguini was created with Barossa chorizo, cherry tomato, fresh herb and saffron cream. The delicious linguini held a lovely slight smoky and meaty flavour from the spicy chorizo, where the smoke flavour infused into the pasta itself. The fresh prawns had salty, sea tang which freshened the heavier spiciness of the spicy chorizo. The creamy saffron sauce over the pasta had a nice sweet and savoury tang but wasn’t overpowering and complimented the multiple flavour combinations that tied the whole dish together. The Heirloom Carrot and Lentil Salad was served with radish, Spanish onion, smoked almonds, crisp tortilla, fresh herbs and tahini dressing. The earthy, deep flavours of the lentils and sweeter tones of the roasted carrot paired well with a balance of sweet and savoury. 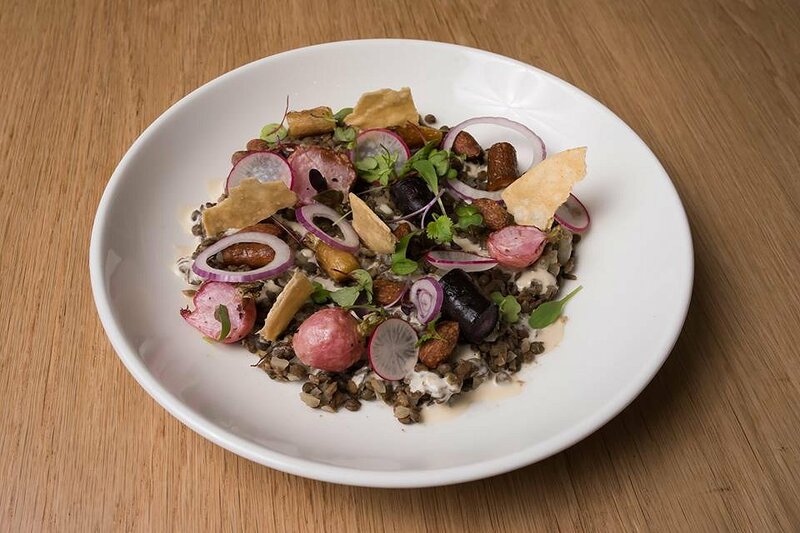 The crunch of the smoky, salted almonds with the crunch of the beetroot, radish and crisp tortillas balanced well with the soft lentils. The added sweet earthy tones of the vegetables also balanced the strong savoury lentil flavour with the crisp tortillas adding a corn flavour to balance. All dishes were wonderfully presented and delicious; we could not find any faults. The new menu is sure to keep customers happy with the bold flavours and the variety of dishes to choose from. “We love getting a bunch of bold flavours and using them to let the dish speak for itself,” Mr Coad said. The wonderful modern style bistro is open seven days from 10am till 4am and in a convenient central location, so there is no excuse to not come and try their new menu out for yourself. So keep an eye out for their next Mushroom Month menu and come pay The Highway a visit today.